Fun fact about the Cherner task chair ($1,500), once popularized by a Norman Rockwell painting: invented by a guy named Norman Cherner. Then a company named Plycraft manufactured it, cutting Cherner out of royalties. Then the owner of Plycraft claimed that Cherner chairs were out of production, though he just rebranded it and claimed he was the designer. 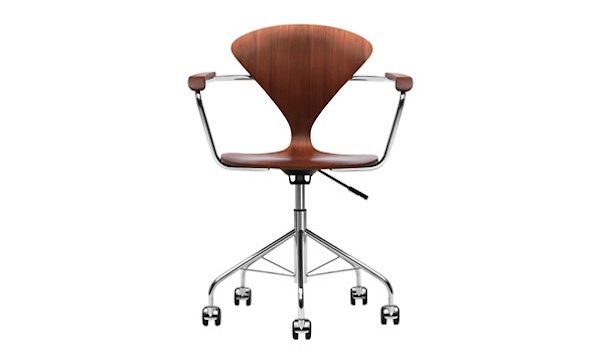 Then the dude finally paid Cherner royalties after being sued, but the chair went out of production in the 1970s. Wait, did we say fun? How about terrible and depressing? Anyway, Cherner’s sons formed a new company in 1999 to revive the design, which is lightweight, swivelling, height-adjustable, with steel arms and walnut armrests. And you can be assured that the money you spend on this Cherner chair will go to someone named Cherner and not some jerk from Plycraft.